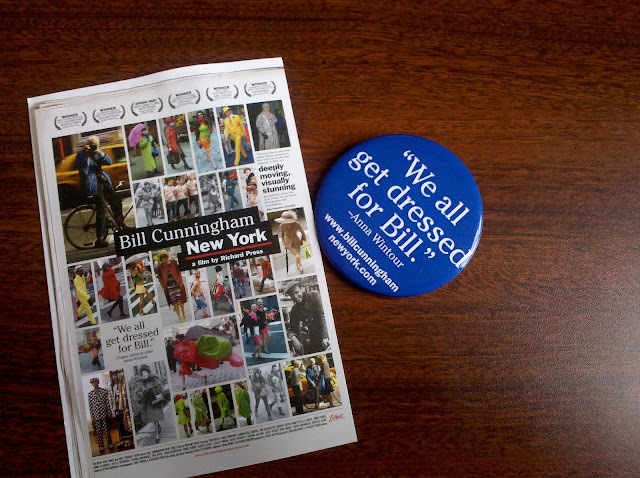 about a week ago, chris and I got a chance to attend a free screening at the Hirshhorn Musem of Bill Cunninghman, New York, a new documentary about the NYTimes street fashion photographer. I posted the trailer here. it was a beautiful, sad, heartwarming, and funny film. Cunningham has given himself -- mind, body, and soul -- to documenting the history of fashion from the early '60s until today. He is still out there every day riding his beat up old schwinn taking photos of interesting outfits and putting them together in a weekly column. He is 81 years old. I still find myself thinking about Bill every once in a while -- is he eating OK? is he so very lonely? is he safe on that bicycle? Can I send him something? This is precisely what he would NOT want though. He wants to be invisible, he says. In any case, you should watch the movie just to witness what it looks like when someone burns themself up completely for a singular passion. It's a beautiful, maaahvelous thing!